My paintings evolve as intimate conversations between the canvas and the variety of materials I work into it: bold and opaque shapes and colors, drips and watery washes, scribbles and scratches, fragments of discarded paintings, as well as written words and graphic elements taken from journals, sketchbooks, and the detritus of daily life. My process is visceral and spontaneous – a counterpoint to the more deliberate, cerebral, analytic activities that occupy much of the rest of my life as a documentary filmmaker. Using paint, collage and a variety of drawing materials, I explore the internal and external landscapes I occupy through a process of discovery and experimentation. I am interested in the dynamic relationship of raw, natural forms and the diverse quality and rhythm of lines that convey emotional meaning. I was greatly influenced by the late Leigh Hyams, my mentor, teacher and friend for twenty years. 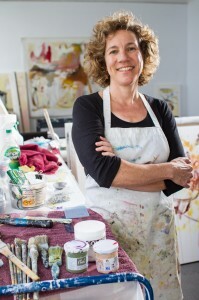 Leigh’s greatest gift to me was nurturing an insatiable joy and curiosity about art, and cultivating an ability to see the art in everything – shapes in the negative space between tree limbs and the beautiful lines in sidewalk cracks; the variety and vibrancy of colors in dirt and vegetables; the temperature of light. These sensibilities fuel my art practice and the work itself.